Swimgen lets you easily create and distribute swimming report cards online. Swimgen has helped my facility to significantly decrease our total cost of reporting. The parents also completely love it. Thanks so much Swimgen! Saves paper, can edit easier if mistakes are made, the best part is the ability to easily look up past report cards for swimmers to see their past progress, parents can access them at anytime, don't get soggy or lost in change rooms. I prefer Swimgen to paper report cards for 2 reasons, accessibility and accountability. Swimgen is user friendly for both staff and for participants and their families. It’s also is a clear record of participants completing levels, and minimizes the number of issues we have regarding wrong assessments and participants in wrong levels. 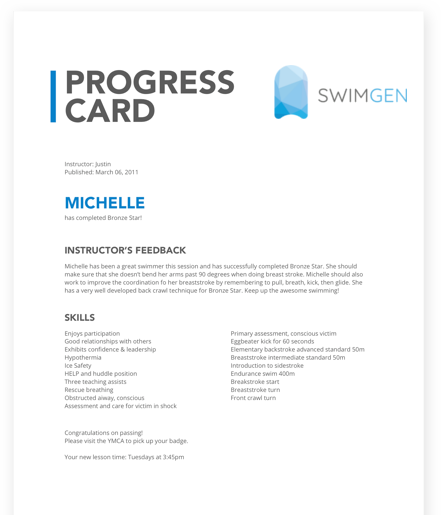 Our staff loved the switch over to Swimgen - it made progress card time much easier for them and it saved them a lot of time. Swimgen allows for my instructors to complete their report cards from any place - any available office,school or at home and we never lose any of the reports. This also allows my supervisors to better track when progress cards are being completed. We approve all of our cards, so it is much easier to get them to our team leaders as opposed to the paper copies. I also like that it is digital and the spelling is corrected and that it is legible. Read through the getting started material, and contact us when you are ready.